Measured values represent approximate 'normal' levels in sample, but do not signify the only possible sample levels. Various factors (e.g. sample storage, assay procedure) can affect results. Mid-regional pro-adrenomedullin as a novel predictor of mortality in patients with chronic heart failure. Von haehling S, Filippatos GS, Papassotiriou J, et al. Mid-regional pro-adrenomedullin as a novel predictor of mortality in patients with chronic heart failure. Eur J Heart Fail. 2010;12(5):484-91. Adrenomedullin: a new target for the design of small moleculemodulators with promising pharmacological activities. Julián M, Cacho M, García MA, et al. Adrenomedullin: a new target for the design of small molecule modulators with promising pharmacological activities. Eur J Med Chem. 2005;40(8):737-50. García-unzueta MT, Berrazueta JR, Pesquera C, et al. Levels of plasma total adrenomedullin are related with two acute phase inflammatory reactants (fibrinogen and sialic acid) but not with markers of endothelial dysfunction in Type 1 diabetes Adrenomedullin and vascular risk factors in Type 1 DM. J Diabetes Complicat. 2005;19(3):147-54. Adeghate E. Molecular and cellular basis of the aetiology and management of diabetic cardiomyopathy: a short review. Mol Cell Biochem. 2004;261(1-2):187-91. Two molecular forms of adrenomedullin in congenital heart disease. Watanabe K, Nishikimi T, Takamuro M, et al. Two molecular forms of adrenomedullin in congenital heart disease. Pediatr Cardiol. 2003;24(6):559-65. Increased oxidative stress is associated with elevated plasma levels of adrenomedullin in hypertensive patients with type 2 diabetes. Katsuki A, Sumida Y, Urakawa H, et al. Increased oxidative stress is associated with elevated plasma levels of adrenomedullin in hypertensive patients with type 2 diabetes. Diabetes Care. 2003;26(5):1642-3. Molecular forms of adrenomedullin in pericardial fluid and plasma in patients with ischaemic heart disease. Nishikimi T, Shibasaki I, Iida H, et al. Molecular forms of adrenomedullin in pericardial fluid and plasma in patients with ischaemic heart disease. Clin Sci. 2002;102(6):669-77. Nishikimi T, Junichi M, Yasu T, Takeshi S, Kangawa K, Matsuoka H. Two molecular forms of plasma adrenomedullin during tilt test in healthy subjects. Peptides. 2001;22(11):1867-72. Adrenomedullin (AM) is a 52 amino acid vasoactive peptide discovered in 1993. 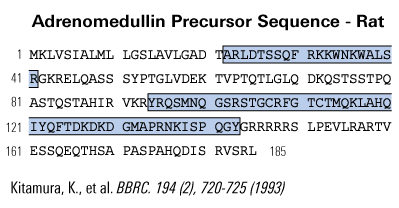 A member of the calcitonin family of peptides, it shares sequence homology with the calcitonin gene-related peptide (CGRP) and peptides from the pancreatic amylin family. 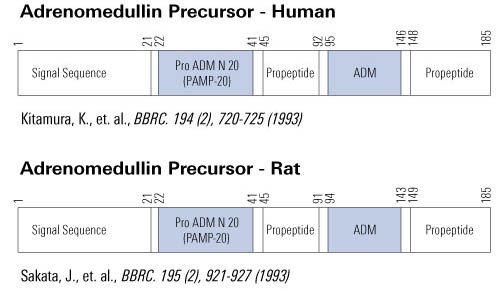 cDNA sequences of rat, pig and human reveal that preproadrenomedullin consists of 185 amino acids, with 3 sites of paired basic amino acids as targets for prohormone-processing proteolytic cleavage. AM is produced by several tissues, including adrenal medulla, lung, kidney, retinal pigment epithelium, neurons, astrocytes, vascular endothelium, vascular smooth muscle cells and heart. It plays an important role in physiological regulation of circulation, having a potent hypotensive effect when infused into circulation. It increases cardiac contractility, dilates coronary arteries and modulates stretch-induced ANP (atrial natriuretic peptide) release. AM is up-regulated under various pathophysiological conditions, such as myocardial ischemia, systemic inflammatory response syndrome, hemorrhagic and endo toxic hock, chronic hypotension in hemodialysis, cirrhosis and pulmonary hypertension. Correlation of adrenomedullin gene expression in peripheral blood leukocytes with severity of ischemic stroke. Liu J, Yan J, Greer JM, et al. Int J Neurosci. 2014;124(4):271-80. Anxiety disorders are associated with increased plasma adrenomedullin level and left ventricular hypertrophy in patients with hypertension. Kong DG, Gao H, Lu YQ, et al. Clin Exp Hypertens. 2014;36(1):27-31. Relationship between neonatal adrenomedullin and bilirubin levels. Erdinc K, Sarici SU, Akgul EO, Agilli M, Ozcan O. J Matern Fetal Neonatal Med. 2014;27(1):30-5. Plasma level of adrenomedullin is influenced by a single nucleotide polymorphism in the adiponectin gene. Wong HK, Ong KL, Leung RY, et al. PLoS ONE. 2013;8(8):e70335. Decreases in adrenomedullin expression and ciliary beat frequency in the nasal epithelium in tubal pregnancy. O WS, Li HW, Liao SB, et al. Fertil Steril. 2013;100(2):459-63.e1. Liao SB, Li HW, Ho JC, et al. J Clin Endocrinol Metab. 2012;97(6):2105-12. 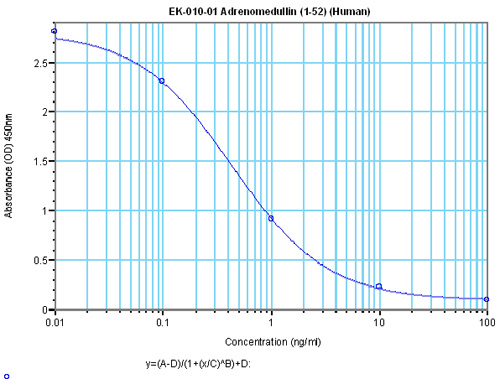 Expression of adrenomedullin in human oviduct, its regulation by the hormonal cycle and contact with spermatozoa, and its effect on ciliary beat frequency of the oviductal epithelium. Li HW, Liao SB, Chiu PC, et al. J Clin Endocrinol Metab. 2010;95(9):E18-25. Dissolution of bio-active dentine matrix components by mineral trioxide aggregate. Tomson PL, Grover LM, Lumley PJ, Sloan AJ, Smith AJ, Cooper PR. J Dent. 2007;35(8):636-42. Plasma adrenomedullin levels in patients with polycystic ovary syndrome. Ucar B, Noyan V, Caglayan O, Yucel A, Sagsoz N. Fertil Steril. 2006;86(4):942-8. A critical role for adrenomedullin-calcitonin receptor-like receptor in regulating rheumatoid fibroblast-like synoviocyte apoptosis. Uzan B, Ea HK, Launay JM, et al. J Immunol. 2006;176(9):5548-58. Circulating adrenomedullin in obstructive sleep apnoea. Schulz R, Flötotto C, Jahn A, et al. J Sleep Res. 2006;15(1):89-95. Adrenomedullin is highly expressed in blood monocytes associated with acute Kawasaki disease: a microarray gene expression study. Nomura I, Abe J, Noma S, et al. Pediatr Res. 2005;57(1):49-55. Expression of adrenomedullin and its receptors in human salivary tissue. Kapas S, Pahal K, Cruchley AT, Hagi-pavli E, Hinson JP. J Dent Res. 2004;83(4):333-7. Adrenomedullin in cirrhotic and non-cirrhotic portal hypertension. Tahan V, Avsar E, Karaca C, et al. World J Gastroenterol. 2003;9(10):2325-7. Adrenomedullin expression by gastric epithelial cells in response to infection. Allaker RP, Kapas S. Clin Diagn Lab Immunol. 2003;10(4):546-51. Regulation of adrenomedullin secretion in cultured human skin and oral keratinocytes. Kapas S, Tenchini ML, Farthing PM. J Invest Dermatol. 2001;117(2):353-9. Autocrine role of adrenomedullin in the human adrenal cortex. Thomson LM, Kapas S, Carroll M, Hinson JP.J Endocrinol. 2001;170(1):259-65.